In May last year, The Sunday Times surveyed the best locations in Britain and their official winner and the best place to live was mini-metropolis York, North Yorkshire. Home to period buildings and stunning scenery, we’re also a county of inspiration which is why we’re certain that Yorkshire is a leading region for arts and culture. From the birthplace of Hockney and The Bronte sisters to our galleries that celebrate craft, here are 8 reasons why we think that Yorkshire is the capital of creativity. Born in the village of Thornton in the mid 19th century were the talented Bronte Sisters. Accomplished poets and novelists they were later associated with Haworth in West Yorkshire. Charlotte's Jane Eyre was the first to success, with Emily’s Wuthering Heights soon to follow. Bram Stoker’s novel, Dracula, also found life in the atmospheric harbour town of Whitby. Originally born in Bradford during the late 1930s, David Hockney is a Yorkshire painter known for his prolific landscape work. After a move to states in the 1960s, Hockney contributed to the pop art movement. On his return in the nineties, he then released more than 100 new paintings of Yorkshire. It doesn’t take much to get inspired in Yorkshire, not with our period buildings. Then there’s castles and ruins that bring life to the past and hide a wealth of history and mystery. If you’re one for a sketch-on-the-go then check out some of Yorkshire’s best heritage sites. A transportable easel will make things easy for straightforward, unparalleled drawing. It’s fair to say that when it comes to galleries, in Yorkshire we are spoilt for choice. There’s over fifty to choose from that suit all ages and allow visitors to learn something new. If you’d like to see Yorkshire’s Hockney in action, head on over to Cartwright Hall. Alternatively, Mercer Gallery offers 20th-century fine art in the heart of spa-town Harrogate. There’s nothing quite like a summer festival, especially when there’s art and music. So this year’s lineup does not disappoint and offers something enriching for everyone. If walking is your thing try Swaledale Festival, 25th of May to the 8th of June. Grassington Festival is also set to be lively as is Underneath the Stars 2019! With 2.9 million acres in total, Yorkshire is one of the UK’s largest counties. So it’d be a shame not to capture its brilliance by indulging in a spot of outdoor painting. For painting on the move try this Derwent Set to give your landscapes increased intensity. If you prefer working from photo then this Bob Ross Kit has everything you need to create impressive oil paintings. Racking up 40 years of contemporary sculpture, YSP is a leading centre. It’s year-round exhibitions also include work from world prominent artists. This summer make sure to look out for the Yorkshire Sculpture International festival. Running from the 22nd of June to the 29th of September, catch Damien Hirst make his Yorkshire debut. The Art Shop Skipton Of Course! We thoroughly hope you’ve enjoyed our post about glorious, creative Yorkshire! When you’re next in the area please do say hi and pop into our Skipton shop. At The Art Shop Skipton, we actually work with new organisation Craven Arts and we would love to help any Yorkshire creatives find affordable studio space. To find out more about any products we’ve mentioned or to inquire about workshop space, please drop us a line at info@theartshopskipton.co.uk or fill out your details online. Thank you for reading. 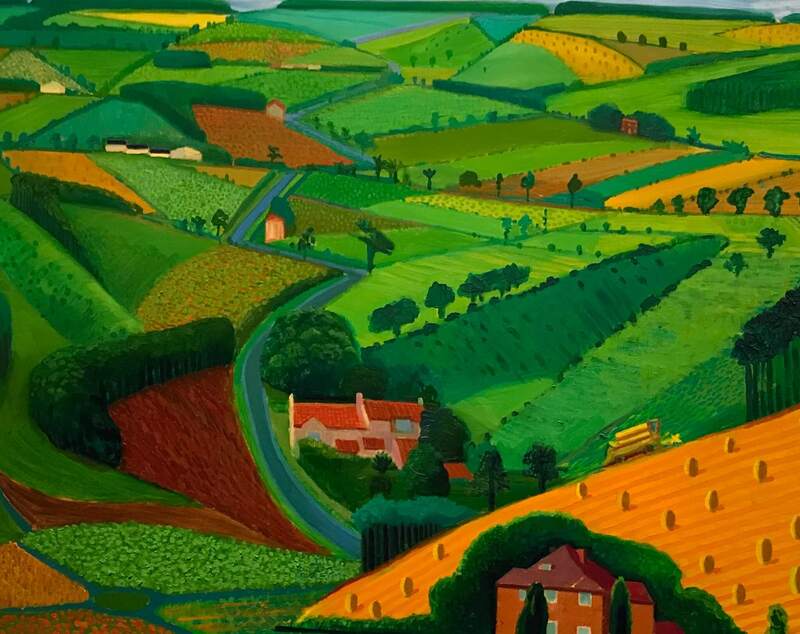 ‘The Road Across the Wolds’ by Yorkshire born artist David Hockney.